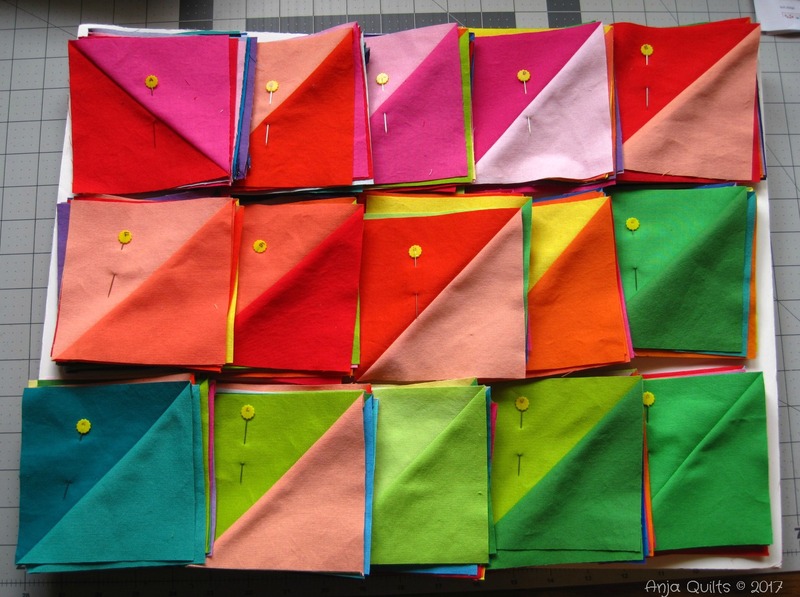 April has been an extremely busy month for me at work, and I have done very little sewing. But I did manage to finish a charity quilt that I started here. 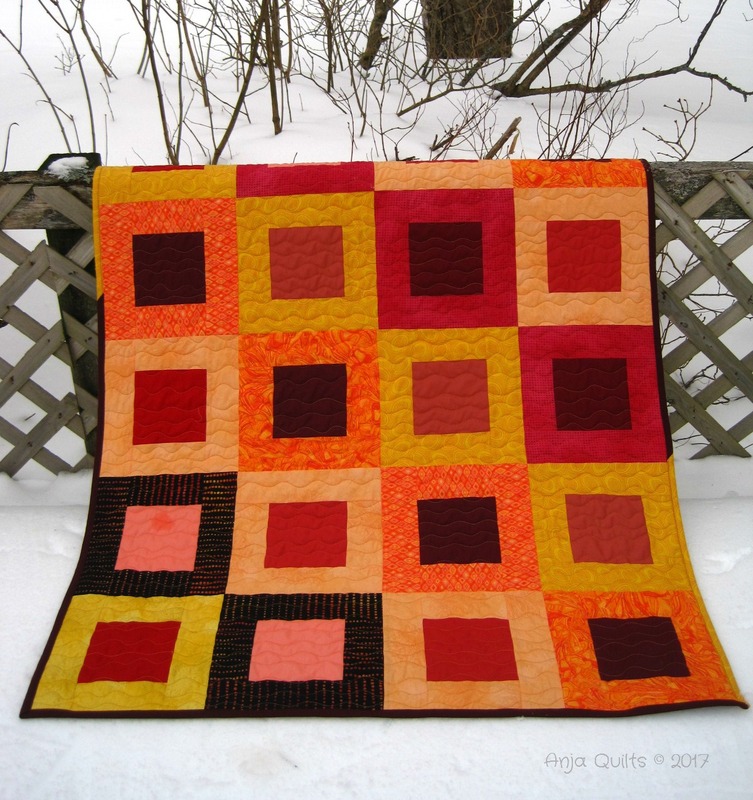 I'm participating again in Hands2Help hosted by Confessions of a Fabric Addict. I did quick organic wavy lines in light pink thread. I like the texture the quilting gives the quilt. Although there are designated charities that will receive the quilts made, there is an option for quilters to donate to a local charity of their choice. This quilt will likely be donated to our local children's hospital. I will definitely make this pattern again. 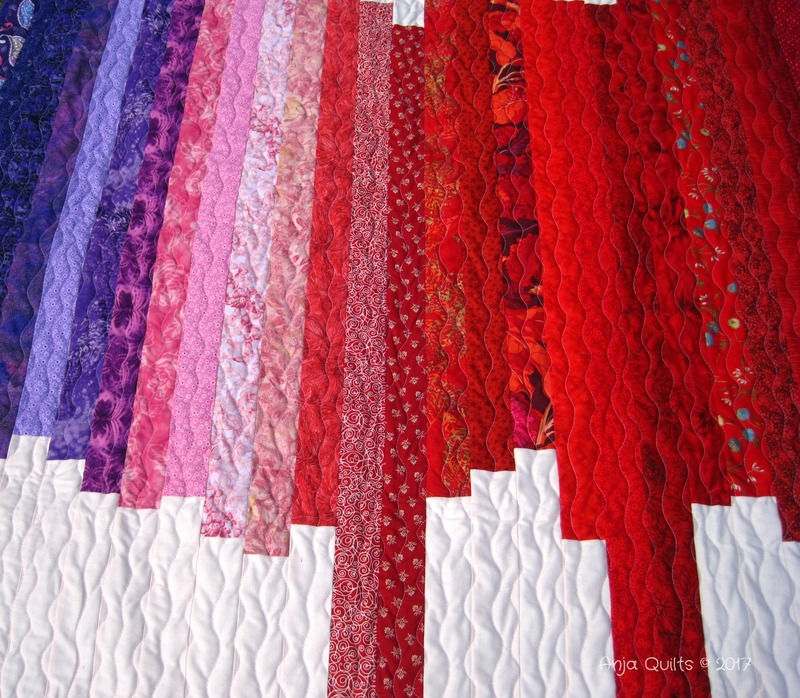 It's a great way to use 2.5-inch strips. 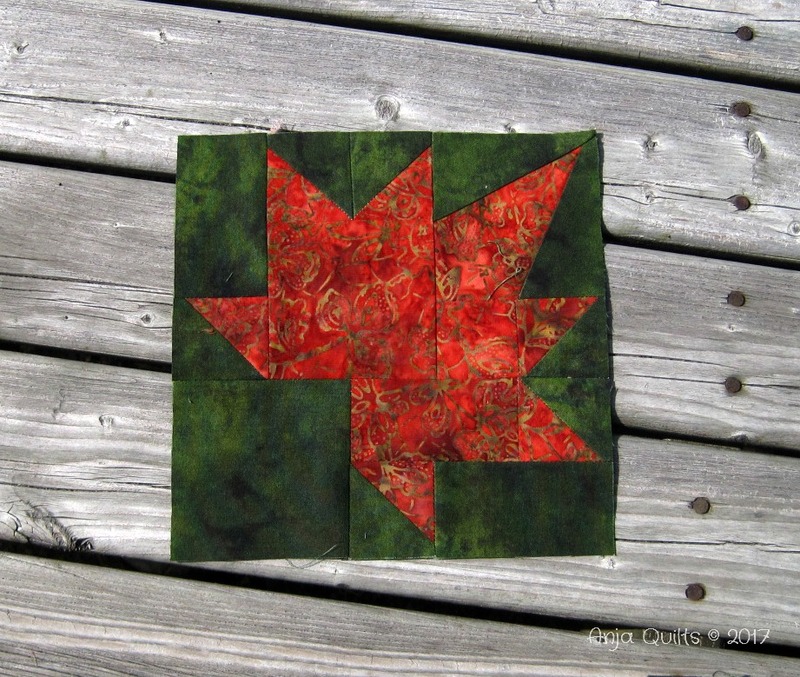 Sandra @ Musings of Menopausal Melon is hosting a quilt along -- Freefall Spring QAL. Instructions are provided every two weeks, and there's still time to join in. I missed the first progress link up, but I've managed to catch up. 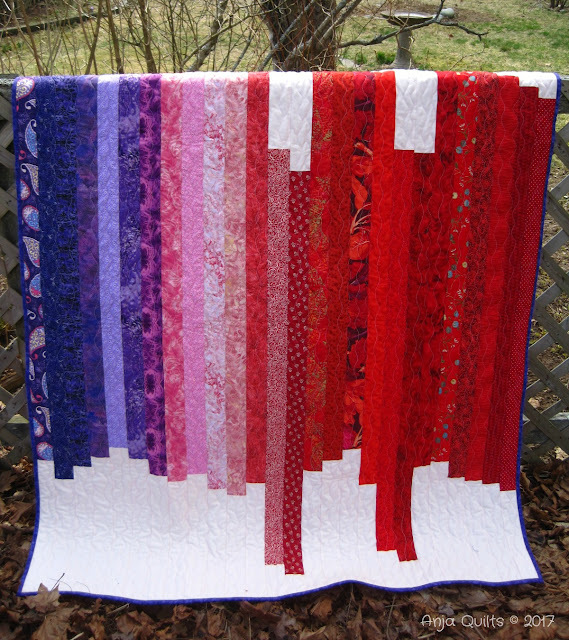 The first eight blocks are 8-inches square. 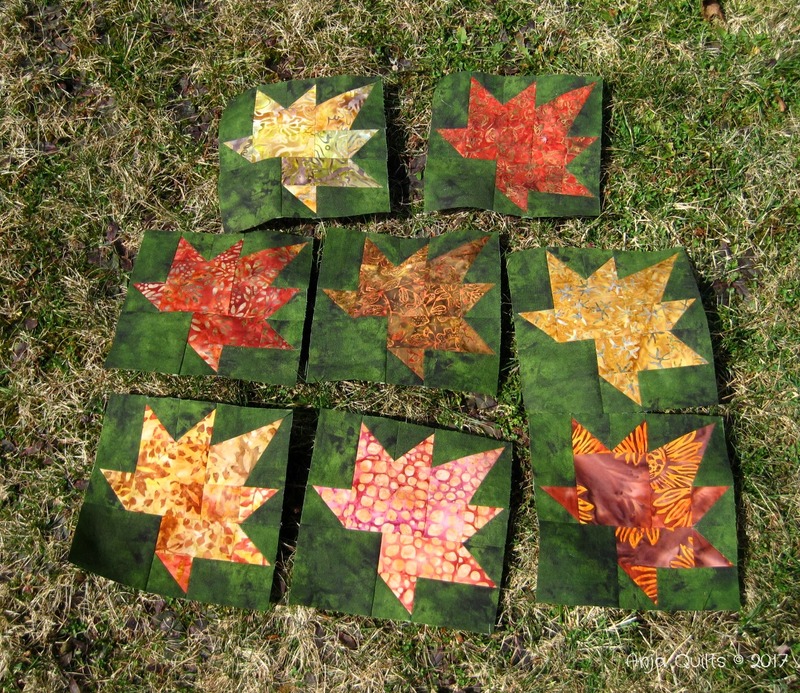 I used some batiks I had in my stash for the leaves. 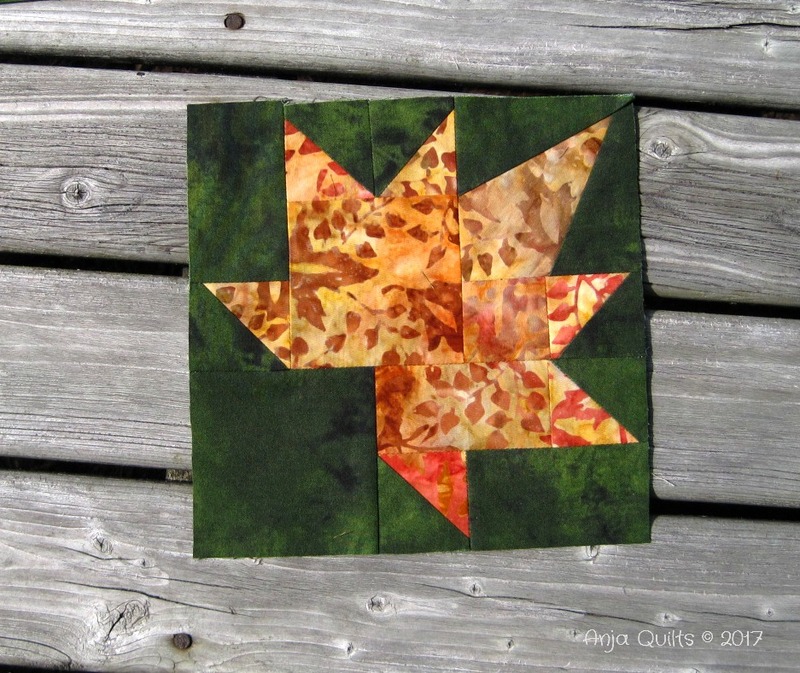 And to show that the snow is all gone, some leaves in the wild. I'm linking up my progress here. I'm making progress on my Postcard from Sweden quilt. But unfortunately, I've been so busy with work, that it's taken me four days to type this post. 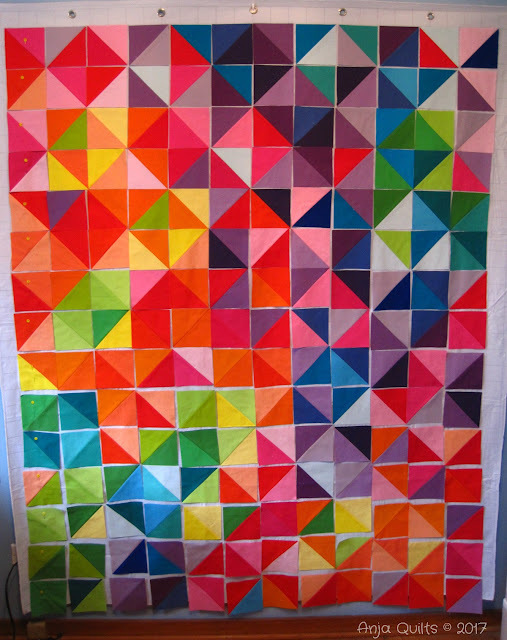 I started out here with a pile of squares and triangles. They've now been turned into HST's. I'm linking up my progress with Myra @ Busy Hands Quilts. I'm off to try to squeeze in an hour of sewing before doing my homework for tomorrow's class. 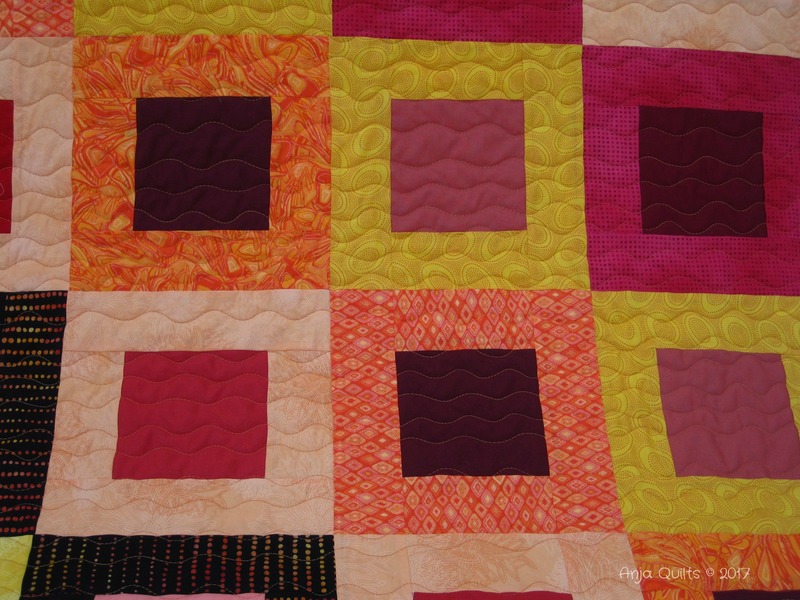 My LQS has asked me to teach another beginner modern quilt class. 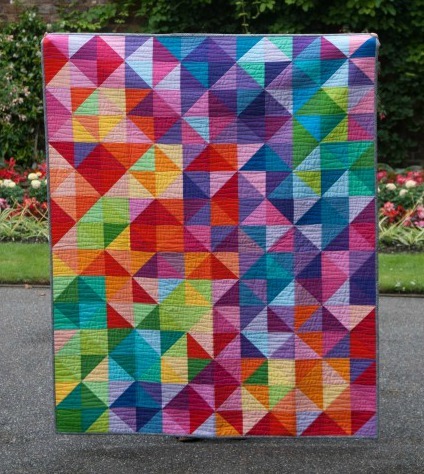 I thought a square in square quilt would a good choice to show traditional quilters how traditional fabrics can be used in a modern way...baby steps. 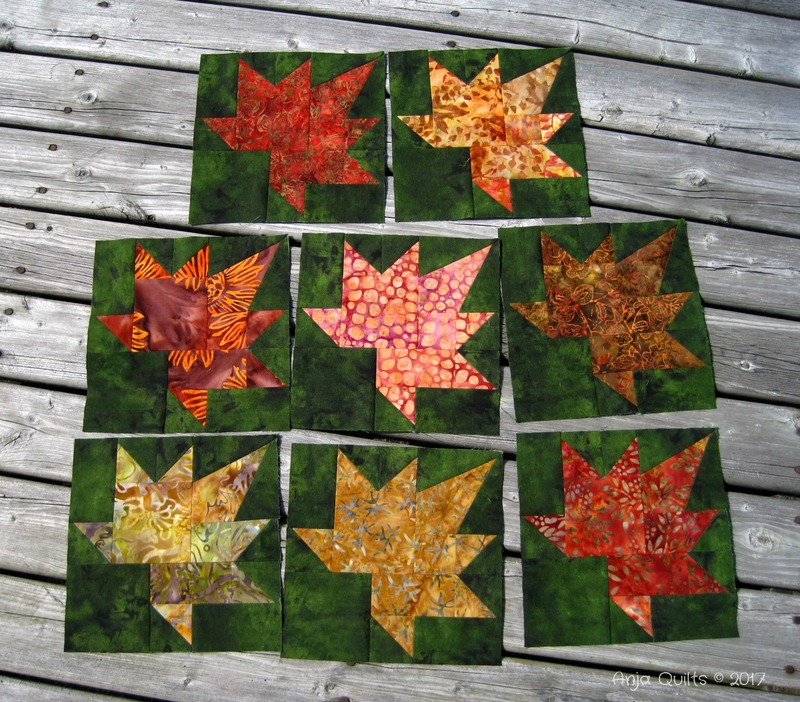 I used Kona solids for the centres and prints for the outside. 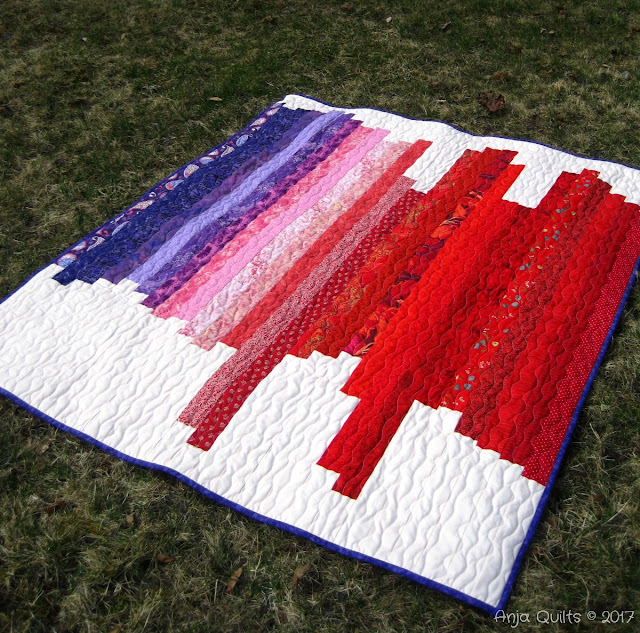 The quilting is organic wavy lines. These photos were taken when we had snow, but it's all gone now. Yeah!! 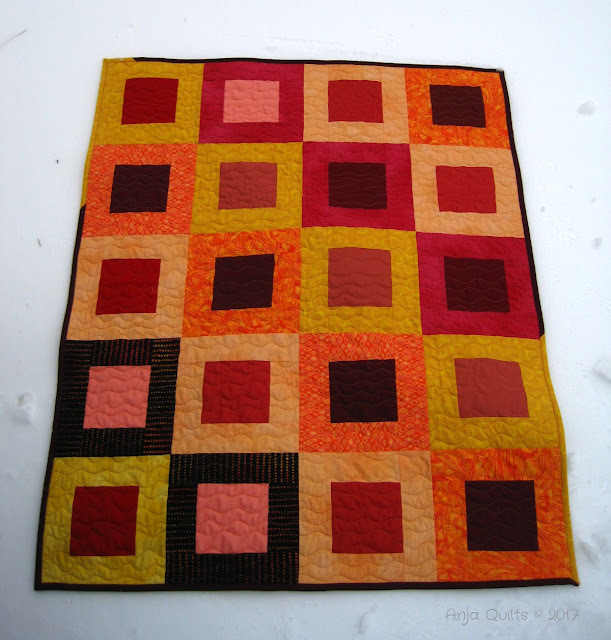 There's been no sewing for me this past week -- it's still busy at work. But I did some prep work tonight, so I can get right to sewing in the morning. 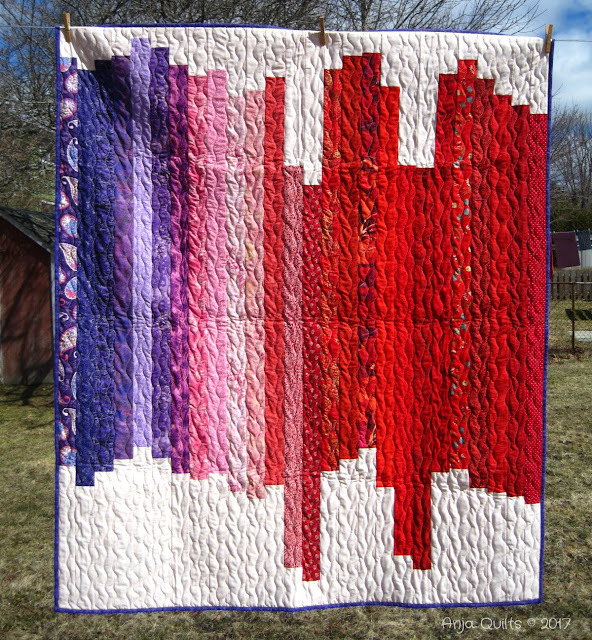 Here's to a good night's sleep so I am well rested to spend all day Saturday in my sewing room.